>>> now to the news from overseas, escalating tension tonight in libya. once again there are reports that moammar gadhafi fired scud missile at rebel forces for the first time in this ongoing civil war . we haven't heard that had hardware mentioned since the start of the iraq war . it missed the darket, landing in the desert instead. tonight, the rebels claim to be preparing an assault on the capital city tripoli. 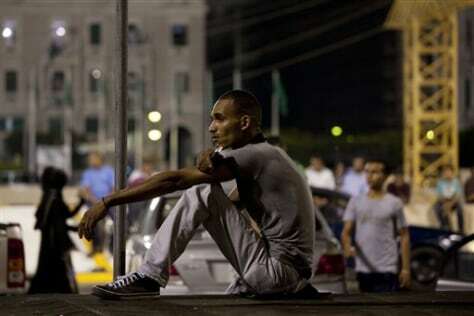 In this photo taken on a government-organized tour, a young man sits at the main Green Square Monday in Tripoli, Libya.